Talk Nerdy To Me: 3DS Owners - Get Your Excitebike! 3DS Owners - Get Your Excitebike! It is the best thing to happen to the 3DS yet... or since I opened my 3DS at a bar at 1am checking for a Street Pass only to see my friends really confused faces. 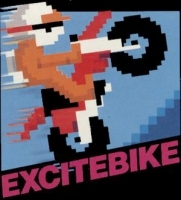 and... wait for it... a FREE download of 3D Excitebike?! Holy crap I just overheated and was forced to pull over. (Someone will appreciate that joke) I just finished downloading and it's pretty nostalgic amaze. Same music, medal stand and capability to design your own course. Who wants to challenge me? ?